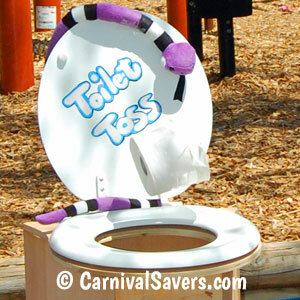 Carnival Booth Idea: Toilet Paper Toss! Another Example of this DIY Toilet Paper Toss Game. Obviously, you will need an adult volunteer who is good at constructing things with wood and possibly someone else who can paint your game booth and make it look nice! *Ask a local building supply if they have a slightly damaged (new) seat they would donate to you for your game. Plywood, possibly donated, to construct the box with a back to support the toilet seat. The design with the "toilet back" shown in the images above is ideal as it prevents too many "over throws" to prevent volunteers from chasing after overthrown rolls to TP. 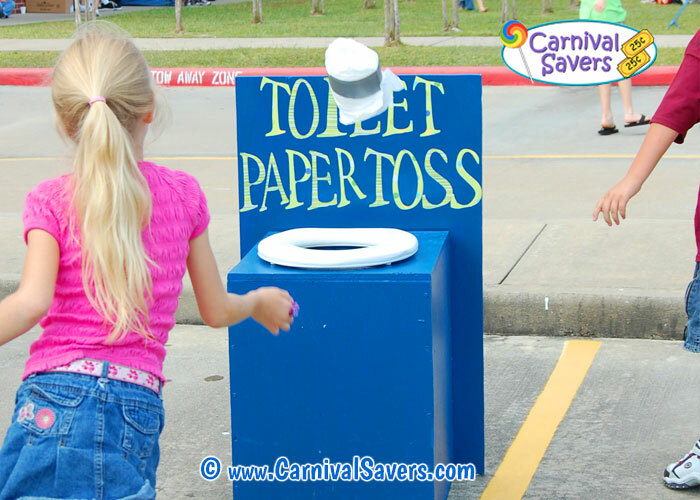 Before the carnival, setup the Toilet Paper Toss game and make a few different lines for various age groups of children. Of course, younger children will be closer to the game to make winning easier for them. 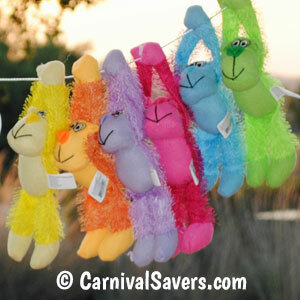 For your carnival prizes, be sure to display them for the kids to see - it makes the game so much fun. So if you have prizes large enough to hang on a line and show off -that is fantastic. Otherwise, smaller prizes can be placed on a table in colorful prize buckets so kids can see what they are trying to win! Players are given 3 rolls of Toilet Paper for a chance to get as many rolls of Toilet Paper in toilet. Don’t forget, if you are pinched for time, feel free to make this game out of a large box - it looks great all painted - and next year you can make it out of wood as shown above. It is fun to theme up some prizes for this game - choosing snakes, lizards, noise putty and as mentioned above, Tootsie Rolls as a consolation will really get a laugh out of some folks who catch on! AWESOME POTTY THEMED SUPPLIES for the TOILET PAPER TOSS GAME!